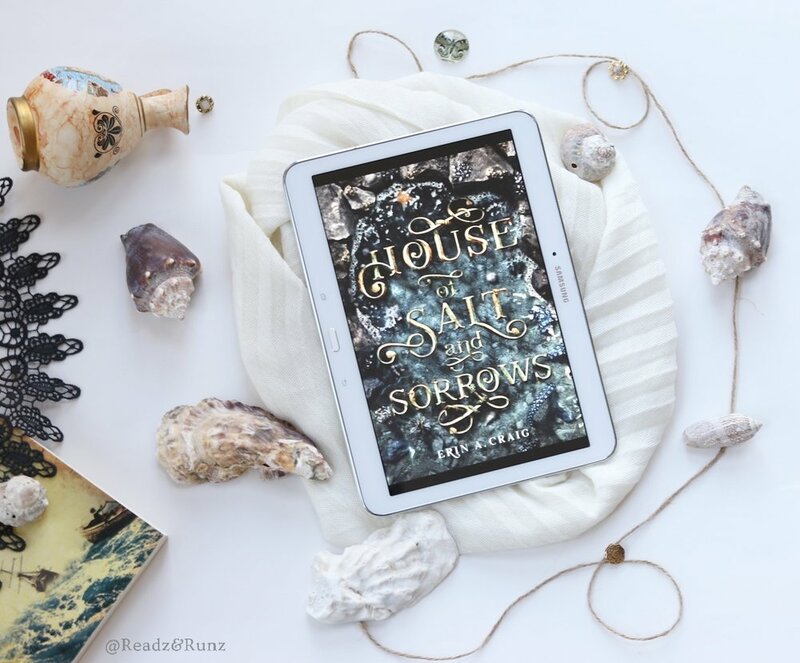 The House of Salt and Sorrows is an enchanting and haunting retelling of the Brother Grimm’s fairy tale “Die Zwölf Tanzenden Prinzessinnen“, “ The Twelve Dancing Princesses" (or sometimes referred to as "The Worn-Out Dancing Shoes" or "The Shoes that were Danced to Pieces"). Erin A. Craig’s spin on the tale delivers a magically engrossing tale including Gods, a suspicious stepmother, magic doorways, haunting visions, terrifying suspense, and sweet romance. A pot of gold for lovers of YA books and fairy tale retellings. THIS MADE MY ‘BEST OF 2019’ BOOKLIST in the YA genre! Highmore is the manor perched high above the sea on an island that houses a duke and his 12 daughters. The place has seen its share of grief in the last months as mysterious deaths are taking one daughter after another. A forsaken, haunted place is what the people on the mainland call the island, and a dark and hopeless mood has spread among the family. After another funeral underway, Annaleigh and her sisters protest the short mourning period their new stepmother imposes. After only a day, she has invited a dress- and shoemaker to cheer the girls up. Amazed and happy, the girls are having a wonderful time getting spoiled, but Annaleigh stays suspicious. She is haunted by the unexplained deaths of her sisters and shocked at the awful graphic drawings of death one of her little sisters makes. The girls are full of cheer and via a secret crevice near the burial chamber down by the sea they slip through and start attending the most spectacular dance balls they have ever imagined. Reluctantly, Annaleigh lets her guard down and finds herself whisked away dancing the nights away. When an old friend and a new love interest are invited to the manor, Annaleigh’s haunted dreams become darker and stronger. And then, another sister goes missing! As the duke is wondering how his daughters keep going through their new shoes over and over, Annaleigh finds herself in a mystery she has to solve but does not know whom to trust. All the right people are at the wrong place at the wrong time and evil slowly spreads the halls of the manor. Will Annaleigh solve the murders before the visions of her own death become true? A sweet dark tale, not to be missed! This novel had me by the neck! Not the first 1/3 of the book, but all after. This is Erin A. Craigs debut novel, and I am at awe at her ability to create stunningly haunting scenes. I actually went back and reread many of them, because I was thinking, ‘how did she do that’? Without fanfare, Annaleigh’s haunted moments were chilling and full of suspense. Un-put-down-able! As for the first part of the novel, the dress-up, and the balls, they were glamorous, sparkly and enchanting – fairytale like. A sweet combo in a YA book, for the young at heart. That part didn’t grab me like the rest of the novel, but I am not the age of the intended audience. I really enjoyed the entire premise and fairy tale retellings are a thing. Complete with a stepmother, a mystery and some romance, a perfect book to escape in. It’s been a very long time since I have heard the Grimm’s tale of “Die Zwölf Tanzenden Prinzessinnen“, but I definitely want to reread and compare. Check out a short synopsis of the original further down. If you like retellings, this is a must and I hope you will love it as I did. Twelve princesses, each more beautiful than the last, sleep in twelve beds in the same room. Every night, their doors are securely locked by their father. But in the morning, their dancing shoes are found to be worn through as if they had been dancing all night. The king, perplexed, asks his daughters to explain, but they refuse. The king then promises his kingdom and each daughter to any man who can discover the princesses' midnight secret within three days and three nights, but those who fail within the set time limit will be sentenced to death. An old soldier returned from war comes to the king's call after several princes have failed in the attempt. Whilst traveling through a wood he comes upon an old woman, who gives him an enchanted cloak that he can use to observe the king's unaware daughters and tells him not to eat or drink anything given to him in the evening by any of the princesses and to pretend to be fast asleep until they leave. The soldier is well received at the palace just as the others had been and indeed, in the evening, the princess royal (the eldest daughter) comes to his chamber and offers him a cup of wine. The soldier, remembering the old woman's advice, secretly throws it away and begins to snore loudly as if asleep.